Additionally, the American Speech, Language, Hearing Association (ASHA) has published Telepractice Service Delivery Regulations. A series of documents for speech/language pathologists and audiologists is available at: Telepractice for SLPs and Audiologists. A good tele-intervention session should look the same as a high-quality traditional home visit. 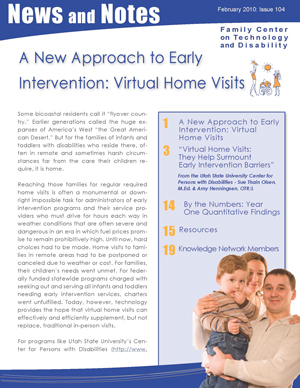 Recommended practices for both TI and traditional home visits include the use of coaching strategies, routines-based interventions, and naturalistic teaching opportunities. The table below summarizes key “best practice principles” that apply to TI (JCIH, 2007; NECTAC, 2008). These four principles are consistent with best practices in early intervention in general and best practices promoting the development of communication in infants and toddlers who are DHH. More detail can be accessed by reviewing the document published by the Joint Committee on Infant Hearing and the document from the Early Childhood Technical Assistance Center. Natural environments are defined in the Individuals with Disabilities Education Act (IDEA, 2004) as services provided in the home and in community settings in which children without disabilities participate – meaning in settings that are natural or normal for children in general.The provision of EI services in natural environments is required under IDEA, yet other references provide valuable insight to fully understand the definition and components of natural environments. According to an OSEP-supported workgroup on natural environments, there are seven principles that demonstrate how the definition of natural environments goes beyond physical setting or location alone. Rather, it involves use of learning activities that are functional, based on the child and family routines; engaging caregivers as essential partners while incorporating family strengths and providing supports to highlight a few of the elements. Given this richer definition of natural environments, TI is consistent with ensuring natural environment requirements. For example, the strong use of coaching strategies within TI is in direct support of natural environments involving a focus on the family by building on their strengths, increasing the ability to foster their child’s development, and using everyday routines as the basis of TI activities. To date, the learning community members have not been challenged by Part C administration questioning TI as conflicting with natural environments. This is most likely due to the TI programs providing thorough descriptions of this mode of service delivery when communicating with Part C policy makers along with input from families about how TI has enhanced their lives and their child’s development. Tele-intervention has been reported to not only support use of natural environments, but also to support many of the 14 IDEA Part C indicators that require state reporting. This information is important to share with Part C administration to demonstrate how providing TI can actually help meet state requirements. The "Skills Checklist for Providers of Tele-Intervention" provides an overview of skills. The free, self-study TI 101 course for providers provides more in-depth, comprehensive information pertaining to training and support recommended for TI providers. 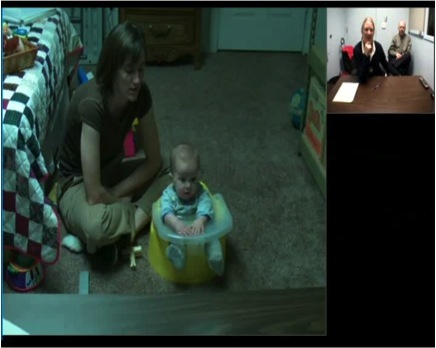 Direct observation of TI sessions: observing live sessions as well as recorded sessions. Provider- to- provider live practice using equipment. Experienced provider mentors provider during first TI session: preparation for session, set up, and implementation of the session. Experienced provider provides feedback to provider. Intermittent group training sessions continue, focusing on trouble-shooting, improving skill set. Group training re: effective coaching strategies for use during TI sessions. Caregivers –typically family members - also need a skill set for participating in TI. This skill set is built on the partnership and coaching received by all recipients of family-centered intervention. In TI, as in any high-quality EI session, the emphasis is on family members as active participants and the primary “teacher” for their child. The free online TI 101 course is useful for new families about to embark on TI. It is important to ensure that the home environment as well as the interventionist’s setting supports optimal listening, which includes limiting distractions. As noted in the Technology and Home Environment Tele-Intervention Checklist, it is important to omit background noises, such as TV’s, radios, and phones. The caregiver should make sure that the child’s hearing devices are in place and working. Both interventionists and families should ensure that others in the home or work environment know when the TI sessions are scheduled and understand the importance of not interrupting. Posting a “Do not disturb” sign sends a clear message, but establishing clear rules about waiting until the session is over is the most practical approach. In accordance with natural environments, instructional materials used in TI are similar to those used in any effective early intervention situation—materials that are part of the child and family’s everyday routines and that are culturally and developmentally appropriate. To facilitate best use of the TI session, interventionists and the family should plan together to identify instructional, everyday materials that the family needs prior to each session, asking the caregiver to be ready with these materials. Due to the use of a computer screen to demonstrate activities for the caregiver, the interventionist doing TI may find it useful to select materials that are larger and more visible over the computer screen, such as picture books. Additionally, a document reader can be used by the interventionist to enlarge the materials, including picture books (see Section IV, Technology, for information on document readers). However, as in any high-quality home visit, it’s important for the intereventionist to move from demonstrations to observing and coaching the caregiver as the primary intervenor with their child. Prior to beginning TI services, it is important to determine the extent to which the family’s home has an adequate internet connection and computer equipment. The "Checklist for Determining Home Capacity for Tele-Intervention" [DOCX] provides a way to record this fundamental information which can then guide the provider in determining if additional internet capacity and equipment are needed. Preparing for a TI session requires planning and organization. However, this effort is typically out-weighed by the amount of travel time that is being saved. The Technology and Home Environment Checklist can be used by families and providers to assure the technology is ready for a smooth TI session. Discussion of continuation of goals or selection of new goals based on present performance. Documents can be shown through the camera, document readers or “share document” on screen to allow parents to see the actual developmental scale, charts, handouts, etc. Summarizing of the session and goals for the coming week. Providing follow up progress notes. This can be done by filling in a template and emailing, scanning interventionist notes and emailing or mailing a hard copy of notes. Allow for 1-2 second time lag in audio transmission. Assure that you are no longer logged on to connection!!! Although TI can reduce travel time for providers, this does not necessarily mean that an EI provider’s caseload can be increased if they’re implementing TI. In fact, providers may need more time for planning and conducting intervention sessions for each family since TI often results in fewer cancellations and thus more sessions being conducted. Conducting TI sessions also requires the provider to attend to technology while maintaining appropriate interpersonal interactions. As a result, EI providers also benefit from time to "reflect and decompress" after TI sessions. It is the learning community’s recommendation that programs make any adjustments to caseloads based on EI provider experiences and collaborative decisions after some time in implementing TI. Monitoring child developmental progress, particularly in regard to language, is an important component of early intervention. 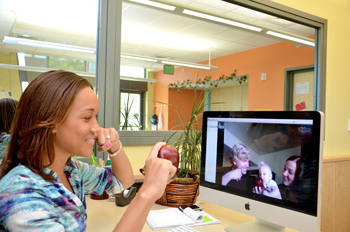 Tele-intervention lends itself to evaluating child performance using observation scales and language samples via a variety of ways. An objective observer or a team member can be present though “off screen”, providing the opportunity to monitor development without potentially impacting the interaction occurring during the session. Additionally, recordings of the sessions also can be used to evaluate child performance using observation scales or to code language samples. These recordings also lend themselves to inter-rater reliability checks to ensure accuracy of coding. TI provides an opportunity to have the audiologist join the TI session to monitor the child’s hearing development, including hearing aid use, cochlear implants, and other devices without requiring the family to come to the center. TI allows the caregiver and the interventionist to consult with the audiologist and address concerns as they arise. Audiological services still require clinical evaluations to occur in sound booths and direct use of audiological equipment, but the ability to observe the child’s behavior in a natural setting via TI is valuable. Standardized tests require strict adherence to the conditions mandated by the test manual. For most standardized tests, this means that administration is limited to traditional face-to-face contacts. Therefore, such testing is typically conducted during a complementary traditional home visit or when the family travels to the early intervention center or clinic. Section VII, Evaluating Tele-Intervention Outcomes, contains additional information regarding evaluation tools for monitoring child development as well as other key constructs. Natural environments are defined in the Individuals with Disabilities Education Act (IDEA, 2004) as services provided in the home and in community settings in which children without disabilities participate – meaning in settings that are natural or normal for children in general. The provision of EI services in natural environments is required under IDEA, yet other references provide valuable insight to fully understand the definition and components of natural environments. According to an OSEP-supported workgroup on natural environments, there are seven principles that demonstrate how the definition of natural environments goes beyond physical setting or location alone. Rather, it involves use of learning activities that are functional, based on the child and family routines; engaging caregivers as essential partners while incorporating family strengths and providing supports to highlight a few of the elements. Given this richer definition of natural environments, TI is not inconsistent with meeting natural environment requirements. For example, the strong use of coaching strategies within TI is in direct support of natural environments involving a focus on the family by building on their strengths, increasing the ability to foster their child’s development, and using everyday routines as the basis of TI activities.